Making your own iced coffee is easy with Coffee Genie. Banish the bitterness, and create sweet and delicious cold brew coffee in your own home. The Coffee Genie system comes with a wide-mouth Mason jar, a stainless steel filter, and a tight lid. To use, place the stainless steel filter in the Mason jar. Add your favorite coffee grounds to the filter and then add water. Let the filter do its magic for 24 hours at room temperature. Once your coffee has filtered, chill and enjoy! 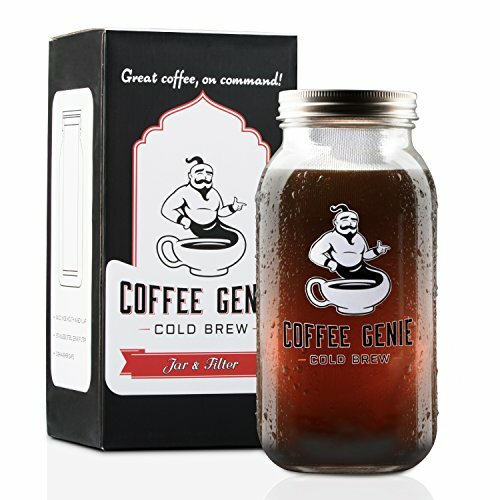 The Coffee Genie cold brew coffee maker simplifies the process so you get perfect iced coffee every time. And it can be used for more than just cold brew coffee! Try making your own fruit-infused waters or tea with the Coffee Genie. The 2-quart Mason jar holds a generous amount of liquid, and the wide mouth makes it easy to brew coffee and drink from. We made the Coffee Genie with durable pieces that are food safe. The 3-cup, 100-micron filter is made with food-grade stainless steel and our leakproof gasket is BPA-free! The large jar lets you brew generous amounts of coffee. And when you're done, just throw all the components into the dishwasher. It's never been so easy! Stop spending extra money buying iced coffee every morning, and just brew your own. Your Coffee Genie comes with detailed instructions and a lifetime warranty. We're confident our smooth-seam manufacturing process surpasses the competition in every way-guaranteed. Our Coffee Genie is made in the USA! Get more caffeine and flavor with lower acidity. Let the Genie make your coffee dreams become brew! If you have any questions about this product by Coffee Genie, contact us by completing and submitting the form below. If you are looking for a specif part number, please include it with your message.